Greetings from Kate, Mandy, Maija and Elissa. For schools in Australia and New Zealand students and teachers are just coming back from the mid-year winter break and for overseas schools, it will soon be the beginning of the new school year. Our best wishes to everyone and especially to those at new schools. Do keep us up to date with contact information. 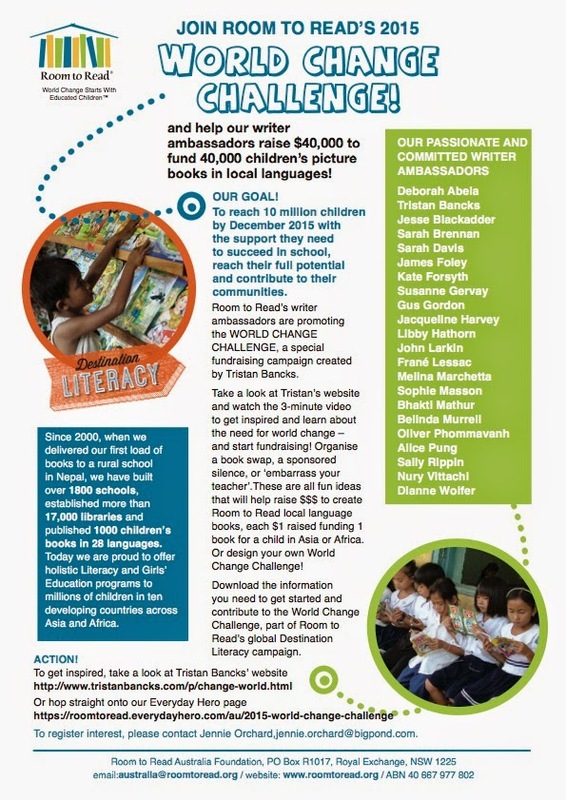 We have attached some information about the latest promotion involving students and writer ambassadors of an amazing organization called Room to Read. Many of you probably know or are even involved with them. How come I (Kate) hadn’t heard about them? Well, I did receive an email apparently back in 2009 but I was busy and it didn’t register and so now I have learnt to my surprise that in just under 15 years they have established over 17,000 libraries, built almost 2,000 schools, published 1,158 new children’s picture books in 27 local languages and by the end of this year they will have had an impact on 10 million children. The extraordinary story of how this was done is described in two fascinating books written by John Wood, the founder of Room to Read. The first book is the absorbing personal story of John Wood who in 2000 was a very busy executive with Microsoft in charge of marketing in the Asia region and based in Beijing. He loved to trek and managed to take two weeks off to go trekking in Nepal. On the first day he happened to meet and started chatting to a Nepali man who was a resource officer for the Education Department. This man was lamenting the fact that although he was a resource officer there was no money for resources. They traveled the first day together and visited a school, where enthusiastic students packed 90 to each mud brick classroom. The Library was a room where a few books like a Lonely Planet Guide to Mongolia and Danielle Steele romances were kept under lock and key in a small cupboard because they were so precious. The headmaster said over a cup of tea, perhaps, if you return sir, you could bring some books? He also said that other travellers had promised to help but no one had ever returned. John was determined and returned some months later with books laden on a number of yaks. Many of us have perhaps also been inspired to help with second hand books into schools in poor parts of Asia. Getting the books from friends and contacts is easy; the hard part is getting them into the country with high costs of shipping and probably customs charges. However John succeeded and was so delighted with the response and dismayed by the enormous need from so many impoverished schools that he started to think that maybe he should leave Microsoft and set up a charity to concentrate on getting books into Nepal. It wasn’t an easy decision and caused considerable angst as he hated to let down colleagues but finally he came to the decision that the need for literacy for students was so much more important. His charity started in a small way but he was determined to think big and to run the organization by applying the business principles that he had learned working in organizations such as Microsoft. How John succeeded in doing this is an absorbing and exciting story. He writes well and is able to convey his own passion and also that of the staff and volunteers involved. By the end of the first book in 2007 Room to Read had set up over 3,000 schools, established over 4,000 libraries and funded nearly 4,000 girls’ scholarships to allow them to attend secondary school. The downloadable leaflets below give some information on Room to Read and also describe a new initiative involving children’s and young adult authors working with students to fundraise for the children of Nepal whose lives were devastated by the recent earthquake. This campaign, The World Change Challenge, was designed several years ago by Tristan Bancks and is now supported by quite a few Room to Read Writer Ambassadors. It has already been set up in Australia and in Hong Kong but Room to Read would welcome the participation of schools in other countries, as well. Bogtrotter runs all day, up and down and around the bog, until it’s time to go home. Although he seems happy enough, he sometimes felt a little bored and wished things would change, but he didn’t know how or what or why. A chance encounter with a frog quietly challenges him to change his routine, to stop and smell the roses, and he gradually adds new experiences to his daily rituals. Ah, much happier! A gentle exploration of the positive things that can happen when we challenge ourselves, try new things, think outside the square. Australian. My Name is Lizzie Flynn: A Story of the Rajah Quilt by Claire Saxby & Elizabeth Newcomb (illus) hardback 9781922179913 $24.95. Based on the story of a quilt made by convict women on board the Rajah, bound for Australia (6-8 years) Australian. Possum Magic Cookbook by Mem Fox & Julie Vivas (illus) hardback 9781742991214 $16.99. Fun recipes based on the classic Australian foods in Possum Magic. Australian. Whoever You Are by Mem Fox & Leslie Staub (illus) pb 9781760152871 $15.99. Back in print! This story weaves its way across cultures and generations, celebrating the bond that unites us all. Australian. Louise, Lynndy and Mandy all loved this book, reviewed in our Feb 2013 newlsetter. 65-Storey Treehouse series by Andy Griffiths & Terry Denton (illus) pb 9781743533222 $12.99. (7-10 years). Due mid Aug.
Lone Wolf: Book 12 CHERUB series by Robert Muchamore pb 9781444914115 $17.99 (Teen fiction/thriller). A Song for Ella Grey by David Almond pb 9781444922134 $14.99 (Teen fiction). Ophelia: Queen of Denmark by Jackie French pb 9780732298524 $16.99 (historical fiction 10-13 years) Australian. Shadows of the Master: Book1 Star of Deltora by Emily Rodda pb 9781742990620 $9.99. New series by author of Deltora Quest, Rowan of Rin, Rondo and Three Doors series (fantasy 9-12 years) Australian. Due Aug.
Vietnam: My Australian Story series by Deborah Challinor pb 9781743628003 $16.99 (historical fiction 10-13 years). Australian. Verity Sparks & the Scarlet Hand: Book3 Verity Sparks by Susan Green pb 9781922244895 $16.95 (mystery fiction 10-13 years) Australian. I loved Bks1&2! Super Weird: Book 4 Weirdo series by Anh Do pb 9781743629314 $14.99 (fiction 8-10 years). Australian. Hugely popular series! Cyclone Fever: Mates series by Sally Morgan & Beth Norling (illus) pb 9781742991030 $12.99 (fiction 7-9 years) Australian. Eve & the Runaway Unicorn: Book 1 Keeper of the Crystals series by Jess Black & Celeste Hulme (illus) pb 9780957988415 $14.99 (fantasy 8-10 years) Australian. Marly & the Goat: Book 3 Marly: Our Australian Girl series by Alice Pung & Lucia Masciullo (illus) pb 9780143308515 $14.99 (historical fiction 8-10 years) Australian.